Cellist Andres Vera spent the week at Island schools working with students. They will perform a concert this Saturday. Last year Andres Vera visited the Vineyard with the Quartet San Francisco. Mr. Vera is the celebrated cello player in the very non-traditional string quartet, which roams through various musical catalogues from jazz to blues, tango, swing, funk and pop. They have been Grammy nominees multiple times and won the International Tango competition. This week Mr. Vera returned the Island as a solo player. Or rather, a solo teacher. 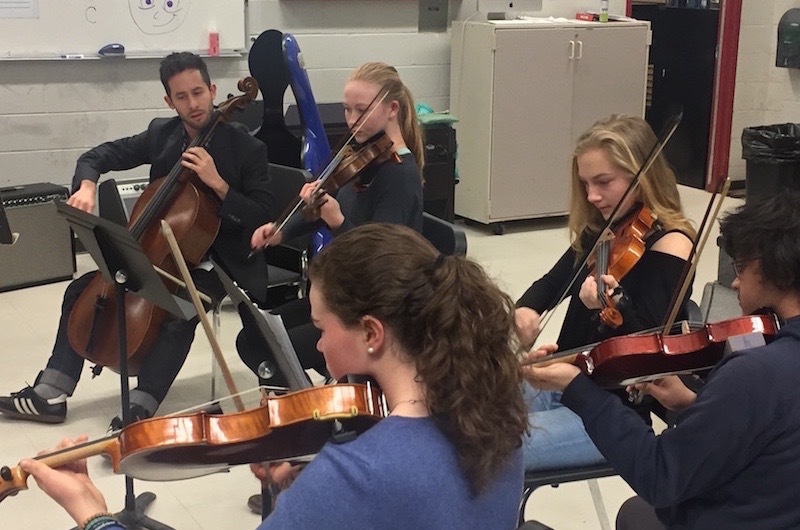 He has been touring the Island schools and teaching the students as part of the Artist in Residency program, hosted by the Martha’s Vineyard Chamber Music Society. He has worked with individual students and school ensembles and given presentations. On Saturday, April 8, he will host a free concert featuring himself, local strings instructors and the students. The concert will be at 4 p.m. on Saturday at the Old Whaling Church in Edgartown. The Artist in Residency program with the chamber music society is funded by a grant from MVYouth and is part of a three-year campaign designed to encourage and support student musicians. For more information, visit mvcms.org.